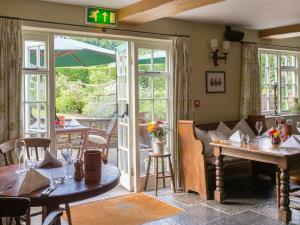 The Bell at Skenfrith01600 750235work RestaurantOur menus change every six to eight weeks and offer locally-sourced seasonal food, much from our kitchen garden when in season. our specials board changes regularly to give an even greater choice. On sundays, we have a set lunch menu (priced at £22 for two-courses and £26 for three-courses). Special dietary requirements can normally always be met (please let us know of these in advance) and we have a delicious children's menu. we regret that under 8s are not allowed in the restaurant in the evenings but we will happily organise supper for them from 5.30pm to 6.30pm. Dogs are allowed in the Bar areas, and we have 3 tables reserved for people with dogs. They are also welcome on the Terrace when outside Dining is possible, all the time at the moment of course! Our menus change every six to eight weeks and offer locally-sourced seasonal food, much from our kitchen garden when in season. our specials board changes regularly to give an even greater choice. On sundays, we have a set lunch menu (priced at £22 for two-courses and £26 for three-courses).